Utthana Ekadasi, or Prabodhini Ekadashi, (also known as Dev Uthani Ekadasi and Hari Prabodhini) is observed during the waxing phase of moon in the month of Kartik (October – November). In 2019, the date of Utthana Ekadasi or Dev Prabodhini Ekadashi is November 8. The importance of Dev Prabodhini Ekadasi narrated to Sage Narada by Brahma. The divine conversation is found in the Skanda Purana. Observing this Ekadasi is believed to help in getting rid of the guilt associated with sins committed and is also a path to liberation (Moksha). Ekadasi is an important fast dedicated to Lord Vishnu. 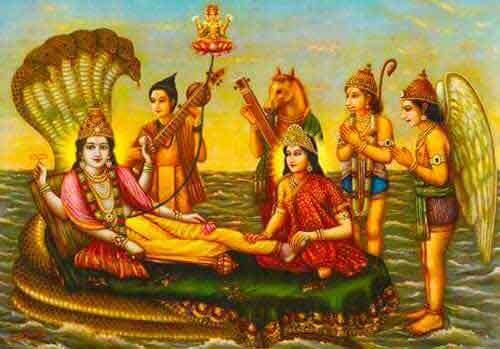 Lord Vishnu goes into sleep on the Ashada Suddha Ekadasi (July – August). He remains in deep slumber during the period and this is known as the Chaturmasya period. He wakes up on the Kartik Shukla Ekadasi and this day is also observed as Dev Uthani Ekadasi. Utthana Ekadasi is thus when the gods (devtas) wake up after a four-month slumber. During the four-month period some Hindu communities avoid performing auspicious ceremonies. Marriages, housewarming, construction of new houses are only performed after the four month period. On Utthana Ekadasi day, an image of Lord Vishnu is drawn on the ground. Lamps are lit around it and fruits and vegetables are offered to this fresh image. In some regions the image is covered with a big brass plate symbolizing that He is sleeping. Bhajans dedicated to Lord Vishnu is sung and he is asked to shed his sleep and wake up and bless people. The famous Tulsi Vivah festival is performed on the day by some communities and also on the day after Ekadasi in some regions. The Chaturmasya Vrata which began on Ashadi Ekadasi concludes on Dev Prabodhini Ekadashi day. The famous Pandharpur Yatra in Kartik month to Lord Vitthal Temple in Pandharpur is observed on the day. Staunch Vishnu devotees observe a rigid fast on the day by skipping food and staying awake during night. Majority of the people take one meal mostly in the evening and visit shrines dedicated to Lord Vishnu. Devotees observe Dev Prabodhini Ekadashi to get relief for sins committed. It is also believed to help in attaining Moksha. In Gujarat, on Dev Prabodhini Ekadashi day some people observe strict fasting and do not even drink water. How to observe Dev Uthani Ekadasi? On Dev Uthani Ekadasi day, an image of Lord Vishnu is drawn on the ground. Lamps are lit around it and Fruits and vegetables are offered to this fresh image. In some regions, the image is covered with a big brass plate symbolizing that He is sleeping. Bhajans dedicated to Lord Vishnu is sung and he is asked to shed his sleep and wake up and bless people. To wake the Lord, children light mustard torches at night and make a lot of noise. As it is an Ekadasi day, people observe the Ekadasi fasting.